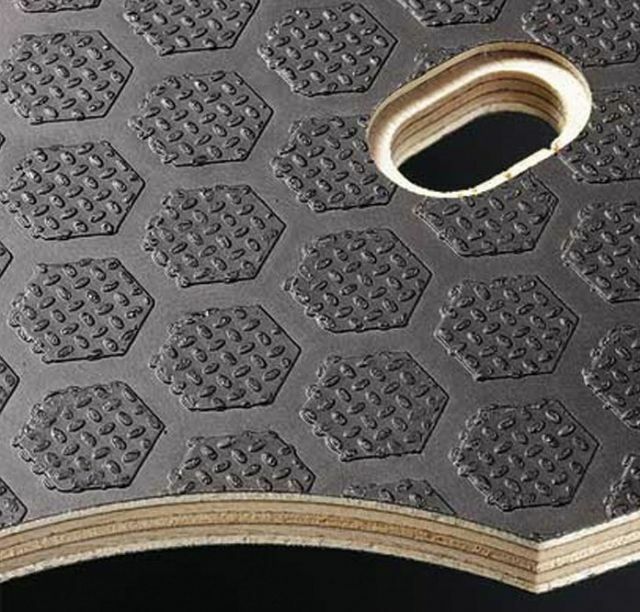 Decorative, yet functional slip-resistant birch plywood board suitable for a wide range of demanding applications. It is easily worked/ CNC machined, has good chemical and weather resistance and is easy to clean. Edges are sealed with acrylic resin paint and are range of thicknesses, colours and sizes are available. Suitable for structural use. FSC® and PEFC certified. Lift and building hoist platforms, shelving, steps, walkways. Shopfitting, exhibitions, stages, tiered arena seating and grandstands. Furniture, workbenches, joinery and construction. Face: Hexagonal pattern phenolic film. Wear resistance (taber value): 570 revs. Rolling test (to BS EN 1818): >10 000. Slip resistance (to DIN 51130): R10. 1220 x 2440 mm only. 1220 x 2440/ 2500 mm only. 1525 x 3050 mm only.